Jean Foster Steckmyer of Grand Island and Central City, Nebraska died October 26, 2018, in Kalispell, Montana. He was 96. A Graveside Service will be held next spring, 2019, in Grand Island. Jean was born August 10, 1922, in Grand Island to John Albert (Jack) and Maude Irene (nee Thayer) Steckmyer. He grew up there, graduating from Grand Island Senior High School in 1940. During World War II, Jean enlisted in the U.S. Army Air Forces. He flew with the 15th Air Force, 779th Bombardment Squadron, as a B-24 pilot in the European Theater, earning a medal with 3 Bronze Stars and an Air Medal with 4 Oak Leaf Clusters. Jean served in the U.S. Air Force Reserve for 40 years, retiring as a Major in 1982. He married Joyce Elaine (nee Enger) Johnsen on May 20, 1949, in Grand Island. They farmed for 6 years in Iowa near Atlantic, and over 9 years in Nebraska near Chapman. In 1964 they opened the NAPA Auto Parts store in Central City, which they owned and operated until retirement in 1982. Jean’s lifetime civic duties included School Board, City Council, Central City Airport Authority, and Chamber of Commerce. 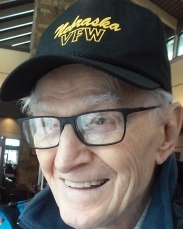 He was an active member of VFW, American Legion, and the First Presbyterian Church in Grand Island and Central City. Jean was and avid bowler, golfer, and pool player; he retained a life-long love of flying, and spent his 95th birthday in the cockpit of a small plane flying over Flathead Lake valley in Montana. Joyce and Jean spent their last years together at Primrose Retirement Community in Grand Island after time living in Texas and traveling widely. Joyce died in 2016, and Jean moved to Montana to be near his daughter in 2017. Jean Steckmyer will be remembered as a witty, gracious man who loved to joke; he was a man of integrity and generosity, a loyal friend always willing to lend a hand, and a real gentleman. He was preceded in death by his parents, two brothers (John and Gerald), sister (Shirley), wife, and son (Steven Charles “Steve” Steckmyer). He is survived by his daughter, Sharyn and her husband David Curtis of Kalispell, and their sons and daughter-in-law, Adam Curtis of Salt Lake City, Utah, and Aaron and Alison Curtis of Minneapolis, Minnesota, plus numerous nieces and nephews.